The DELUXE Universal Water Treatment Install Kit has everything you need to install water treatment equipment in your home, plus two convenient gate valves. The STANDARD Universal Water Treatment Install Kit has everything in the deluxe kit but the two valves. PurGuard® Universal Install Kits include what you need to hook up most makes or models of water softeners, automatic filters, whole house canister filters or ultraviolet disinfection units. Clear instructions are included and the 800 toll free hotline provides expert phone assistance to answer any questions you have about do-it-yourself installation. The Deluxe kit includes 2 gate valves so you can shut water off before and after a unit (instead of a main water line) allowing the easiest maintenance or repair access to your new unit. 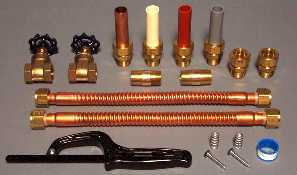 Works with interior (3/4'') plumbing lines of Copper, CPVC, Pex or Poly material.